Island Windjammers offers 6, 9, and 12 night Caribbean tall ship sailing cruises out of Grenada and St. Maarten. Our sought-after 12 night Explorations cruises, extended Wanderer Cruises, and other featured trips such as our annual Rum Cruise are also offered periodically throughout the year. Our destinations include the Grenadines, a chain of islands in the Caribbean’s Windward Islands, as well as the Leeward Islands. The Grenadines is considered to be one of the most exclusive sailing areas in the world. Our tall ship sailing cruises include an amazing selection of the most desired ports of call, including locations unreachable by the masses on larger ships. "By far the best vacation we've ever taken. So relaxing, a great group of people, superb crew." "We were all kicking ourselves for not booking two weeks back to back. One is just NOT enough!!!! The ship and crew were great and the islands are now our favorites. 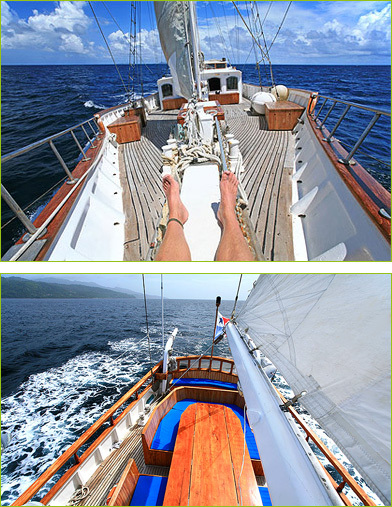 …The Diamant is now our favorite windjammer ship!" "The ship was terrific, crew was better, the captain loyal and strong, the weather beautiful, the food was delicious and the islands visited were the places that lifetime memories are made of." "Rejuvenation! Worldly cares slowly eroded away with every ripple of an emerald sea, every balmy breeze, every ray of sun." Island Windjammers is committed to providing you with the vacation of a lifetime! We welcome our past and future guests' feedback as we continue to expand our company. Future plans include fleet expansion and new itineraries. Join us, and set sail for a passage less traveled!